Sharing of experiences associated with Silver Russell Syndrome is a great way to provide information and guidance to all those associated with the condition. This is particularly valuable to parents who have recently had a child diagnosed. We would like to increase the number of personal stories, please send yours and we will add it to the web site. Your experiences, either as a parent or a person with SRS, could make a huge difference to another child or parent. Problems in the pregnancy began at 17 weeks, following an amniocentesis test. The amniocentesis didn’t go according to plan and a couple of hours later I was back in hospital, because it seemed that the membranes had ruptured. The doctors were very pessimistic and I was put on bed rest for a few days and monitored closely. Following numerous checks and scans I was discharged from hospital after two weeks and told to take it easy for the rest of the pregnancy. From then on I had to attend the antenatal clinic three times each week. I was monitored each time and had to have blood taken, and various other tests. I also had ultrasound scans each week from around 22 weeks. It was at about this time that they discovered that Georgia wasn’t growing as well as she should have been. At 28 weeks and following another scan and monitoring, it was decided the baby was not doing at all well. The consultant though, really wanted the pregnancy to continue for as long as possible on the basis that the baby would be better off in the womb than in an incubator. This continued for another 8 weeks, by which time the doctors decided hopefully now the baby would be strong enough to enter the world. They estimated at this stage that Georgia was about 2kg. She was also breech so they decided a caesarean section would be advisable. 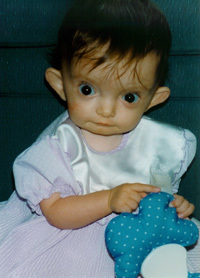 Georgia was born at 36½ weeks gestation on the 10th September 1997, weighing just 1.71 kg (3lb 12oz). She was immediately whisked off to the Special Care Baby Unit (SCBU). The first few days were very difficult. Georgia was breathing with the aid of oxygen and when I first went to see her she was so tiny and covered with all sorts of tubes. I was allowed to hold her for the first time after about 24 hours. Georgia was a bit of a puzzle to the medical staff because they couldn’t understand why she was so small. They were convinced that she was only around 32 weeks but we knew this wasn’t the case. After a few days she was breathing unaided, but she was very reluctant to feed. This continued to be a problem for some time, and was the only thing after a couple of weeks that was really keeping her in SCBU. We tried everything to get her to feed, but she was taking very little orally. Finally though, after three weeks and six days, she was discharged. The feeding problems continued at home and Georgia was very reluctant to feed. It took us over an hour to get her to have about 20ml and by the time she had finished it was almost time for the next feed! During those first few days we tried so many different teats but she just wasn’t interested. She never woke in the night for her feeds so we had to set the alarm clock so that we could wake her up. After eight days at home the midwife was not happy with her lack of appetite, and she was also losing weight. She was readmitted to hospital overnight for observation. During this time the hospital staff apparently had no problems feeding her so she was discharged the following day with the disposable teats that they were using. We had found that Georgia did go through periods of feeding reasonably well, which was obviously what had happened in hospital. At home we were back in the same situation; she still took hours to feed; she just had no interest at all. We struggled along for another week or so and then Georgia became ill with a cold so the feeding was even more difficult. After a couple of days we took her to the doctor’s because we were worried about her breathing. He checked her over and didn’t feel it would be too much of a problem, but he was quite concerned about her feeding difficulties. During the night her condition deteriorated and she seemed to be having a lot of difficulty breathing. The following day Georgia was readmitted to hospital with suspected bronchiolitis. It seemed to take forever for the hospital to sort her out. They gave Georgia numerous tests, including a lumbar puncture because it was suspected she may have had meningitis. At about 2am, after hours of waiting, she was diagnosed with Respiratory Syncytial Virus (RSV). The probability was that she had caught this virus when she was in hospital overnight because of weight loss and feeding difficulties. One doctor was very concerned about her condition; she asked, ‘Why is this child so emaciated?’ It was during this stay in hospital that ‘IUGR’ was referred to. I had heard this mentioned a couple of times, and was informed by a nurse that the letters stood for Intrauterine Growth Retardation. At this stage we didn’t realise how much this was going to be part of our lives. After a few days Georgia’s condition began to improve slightly so she was taken off the oxygen. She also had a Nasal Gastric feeding tube placed to help her because she was too weak to feed normally (this is a tube that runs from her nose to her tummy).Georgia had the tube for a few weeks, when it was removed once again she would not feed. After a few days it was suggested that Georgia was well enough to go home. Although we were desperate for her to come home, we were very concerned that nobody was really taking us seriously. We asked if Georgia could stay in until the next day to see if she would gain any weight. Georgia stayed in hospital and was weighed the next day; yet again she had lost weight. They decided to keep her in a little longer. Georgia had lots more tests in an attempt to find out a reason for her size and lack of appetite. This included a ‘sweat test’ to rule out Cystic Fibrosis. Finally, after 3½ weeks in hospital, although her feeding remained a problem, she came home under the care of the community paediatric nurse. The nurse would come to visit us at home on a regular basis and monitor Georgia’s weight and feeding. We were still no closer to finding out why she was the way she was. At home the problems continued, and after one week Georgia continued to lose weight. It was decided to place a Nasal Gastric tube on a long term basis. Although whilst in hospital we were so desperate for her to feed normally, we were now resigned to the fact that she needed extra help. We were relieved because it took a lot of pressure off us and we hoped that this would help Georgia ‘thrive’. We plodded along for the next couple of months; Georgia had another couple of admissions to hospital with coughs, colds etc. She nearly spent her first Christmas in hospital. Fortunately, she was discharged on Christmas Eve. By early February we had had enough. Georgia was now totally tube fed and although she was gaining weight it was very slow and she would often vomit after the whole feed. She had now been labelled ‘failure to thrive’. Her development was also much delayed. She wasn’t reaching any of her milestones; for example she didn’t smile until she was about four months old. She was seen by the paediatrician at our local hospital every couple of weeks, but we felt that we were not getting anywhere. He kept saying, ‘She will catch up eventually.’ We didn’t agree, and felt Georgia was not receiving the specialist investigation and care she deserved. In desperation we took her to the A&E department at the Birmingham Children’s Hospital. She was admitted immediately for tests. Georgia was seen by many specialists, including a neurologist who painted a very bleak picture. He didn’t think she would ever walk or talk, and would be significantly retarded in many ways. She was also seen by a geneticist who at this time didn’t make any diagnosis but said that he would see her again in a few months. Unfortunately, within a few days Georgia became infected with Rota virus (a very severe gastroenteritis). She was extremely ill for a few days and lost over ½ kg in weight in just 24 hours. Luckily once the virus was out of her system she managed to regain the lost weight. To our dismay after about three days she came down with pneumonia. This of course knocked us back even further. She stayed in hospital for about two weeks and we were very happy to take her home (even though we were still no closer to a diagnosis), just in case she became infected with something else. But at least we now felt that she was under specialist care, being a patient of the Birmingham Children’s hospital. We tried to carry on with a normal life, although this was generally quite difficult. Georgia continued to get many infections and the vomiting also remained a big problem. Most mornings she would vomit, usually when I was about to take her sisters, Jessica (6) and Chloe (2), to school. On Georgia’s first birthday she weighed 4.9Kg (10lb 11oz) and she was 63cm in length. When Georgia was 14 months old she was once again admitted to the Birmingham Children’s Hospital for more tests. It was during this stay in hospital that she was visited again by the geneticist. He told us that when he saw Georgia previously he suspected that she may have Russell Silver Syndrome but at the time Georgia didn’t display enough of the characteristics of this condition, so was reluctant to give a firm diagnosis. Now he was very sure that she had got RSS. We were relieved, although we were very concerned that she had this condition, at least we now knew the reason why she was so small and had no appetite. We also had the hope that she would improve over the years. We could now give Georgia the help and support that she needed. Every time we went to the doctors or for a hospital visit we would go armed with the booklet from the Child Growth Foundation. We learned so much about the condition over those first few months and it was wonderful to talk to other parents who were going through the same situation or had come through the other end. Georgia continued to gain weight very slowly and she continued to be very reluctant to take anything orally. One of the problems with Russell Silver Syndrome can be hypoglycaemia; we learned about this the hard way. One morning we tried to wake Georgia but she was very lethargic and reluctant to wake up. At first we thought she was just tired but it became apparent that her feeding tube had somehow become dislodged during the night. We didn’t know when this had happened so were unsure how long she had gone without any nutrition. We didn’t know what to do, so we first of all tried to get hold of Georgia’s nurse, without success. We then tried her consultant and again this was unsuccessful. Eventually his secretary managed to track him down and instructed us to call 999 immediately. The whole thing was a bit of a daze really and I didn’t know what I was doing. It really was a nightmare and the worst of it was that it was totally out of my control. By the time the ambulance arrived, Georgia was also fitting and making some awful noises. The paramedics thankfully took control and she was rushed straight to A&E. Her consultant met us there and we knew she was in safe hands. It turned out that Georgia had become hypoglycaemic and had gone into a hypoglycaemic coma. Her blood-sugar levels were so low they were measuring zero. She was administered the necessary medication and showed a little improvement. She was admitted to the ward some time later but it took about 24 hours for her to come around. Upon being discharged from hospital three days later and we were given equipment to check her blood sugar levels in case of a similar problem. Thankfully, this has not happened since, although we are always aware, just in case. When Georgia was 2½ she was fitted with a gastrostomy (a feeding tube directly into her stomach through a hole in her abdomen). Georgia seemed to be much healthier and not so ‘delicate’. She started to walk on the 1st December 2000, at three years and nearly three months old. We were all so proud of her, and she took the lead role as a ‘star’ in the school’s Nativity, where she took a few furtive steps. Her talking was still a big problem though, and although she had regular speech therapy, we could see no real improvement. At 3½ years old Georgia began growth hormone therapy. At this time she still only weighed just over 8kgs and her height was 78cms. Within a couple of months she had grown considerably and her appetite had increased. Georgia seemed a different ‘little’ girl. After six months on growth hormone she was 85cms. That really was probably the turning point for Georgia. She became much more physically able and her speech was coming along slowly. Our hopes were realised when Georgia started mainstream school in the reception class with 20 hours support from a teaching assistant to help with her educational and medical needs. Georgia has continued to progress really well, at the age of seven years and two months she weighs just a little less than 20kg and is 115cm tall. Her growth has been quite dramatic and currently she is having a break from growth hormone, we will see what the impact of that is. She came off growth hormone eight months ago, and so far although her growth rate has dropped back a little she is still growing. Georgia is also doing very well in school and works incredibly hard. She is very popular at school and has lots of friends. She has just been chosen to learn to play the cello, this is quite an achievement because only four children out of a total of 90 get the chance. She loves dancing, horse riding and swimming. Seven years ago we would never have dreamed that Georgia would have achieved so much. She tries so hard and we are all so proud of her. Georgia is an absolute delight and we wouldn’t want her any other way. I was born in 1974 with Russell Silver Syndrome and a severe cleft palate in the Northern General Hospital, Sheffield. I thought I would write this to help show the positive and the negative experiences I have had living with RSS. For a while, I was unwell with illnesses like pneumonia, bronchitis, etc. In the early years I had 6 semi-successful operations to repair my palate. Although I still have a speech impediment, this is just part of what makes me unique. This period in my Mum and Dad’s life must have been very frightening; I don’t think I can really comprehend their turmoil and distress. I had a growth hormone test at 2 years old and it was established that I was producing growth hormone and having GH treatment would not work. At the age of 3, my Mum and Dad were advised by a paediatrician to send me to pre-school early, as he felt that good social skills were very important. This was, and I believe still is, the best professional advice ever given to my parents. He obviously knew the importance of having a high ‘Social Value’ and being happy around people. In these early years at school, I had a welfare assistant called Mrs. Stocks, who made sure I was able to manage. I remember she made me a set of fold-away steps on wheels so that I could reach the top shelf in the library. I made some good friends who saw it their responsibility to look after me and gradually I needed Mrs. Stocks less and less. My friends used to help me carry the crate of milk in at break time when the other children could carry it by themselves, but I believe it gave them a sense of worth. Bullying was never an issue because of this supportive network of friends. In 1983, we moved down South for a work opportunity that my Dad had. We lived in Surrey for one year where I attended a mainstream junior school, unaided. In 1984, we moved again to Tunbridge Wells. Here, the LEA did not feel that I would cope in the mainstream education system and although my parents tried to put me into the local junior school, the LEA (without meeting me in person) placed me in a special needs school that catered for ‘weak’ children, who for some reason, had fallen back in their education. I remember being told by the Headmaster that I would be a high flyer for a while until the other pupils caught up. Initially, it was a school that catered for children who had missed some of their education due to ill health, and then it extended its remit to children with learning and behavioural issues. After 5 years at Spring Gardens, I had fallen back from the mainstream system and was unable to return to it. My brother had always been into sports and he had started taking me everywhere with him. This was our schedule; Monday evening was Cricket nets, Tuesday was Tennis, Wednesday was Table Tennis, Thursday Tennis again, Friday the local YMCA. Saturday was the Roller Disco, and Sunday I used to watch him play in street hockey matches on roller skates or cricket, which I occasionally joined in with. Although he was 4 years older and of average height, I always used to try to compete with him. I learnt to be happy if I performed well and made him worry that I might actually win. I began to learn that a perfect technique, agility and speed were my tools for trying to beat strength and power. In Table Tennis I used my lack of height by allowing the ball to come down to me below the height of the table and below the sight line of my opponent. I would then put a spin on the ball, so when it bounced it would change direction, go faster or slow down. These were major life lessons for me, I had to do things differently to compete and win against other people of my own age and average height. Nature will always compensate. If you lack height, strength and power, you gain speed, agility and accuracy. This is the same for life skills. Someone dyslexic can be very visual and creative; someone with autism can sometimes have great mathematical abilities. I think it is another attribute for RSS children and adults to be sociable and friendly, this is projected as a natural confidence, which should be encouraged. It was around this time when I had an epiphany. I went on holiday with Mum, Dad and brother to Butlins. They had a sports program for children, where you could do activities to win Bronze, Silver and Gold awards. In our first week, my brother and I took part in the bronze award and successfully completed the goals set. In the second week, my brother continued onto the Silver award. Obviously I wanted to emulate him and do this too. My Mum and Dad were concerned that it might be too much for me; they thought I may not be able to achieve the award, feel like I had failed and be hurt. After a few arguments and tantrums, they relented. I took part in the award scheme and gained the silver award with my brother, but I also won a trophy for the most improved participant of the week. This was the epiphany; I realised that it was up to me to push myself and find my own limits, which is obviously the best motivation and mindset anyone can have. One morning in late 1985, my blood sugar level dropped dangerously low and I spent a week in hospital having tests. After this, my Mum became very anxious about me having another hypoglycaemic attack, and insisted that I carry glucose tablets everywhere and a couple of chocolate bars. For many years after this attack, I would sometimes feel funny and light-headed. I now think that some of these latter moments were mild panic attacks, because it would happen if I thought about overwhelming stuff like the size of the universe or if I was standing alone in the middle of a field. I remember my Nan once saying that “You will be a millionaire by the time you’re 35”. People could see my drive. But then she would also ask my Mum if I wanted a cup of tea, and who would reply, “try asking him”. As I became more fashion conscious and established my own identity, I found it frustrating that I was unable to find small fashionable clothes without some silly motif. So in my Home Economics class at school, which was also the life skills class, I decided to make my own. At this point I aspired, one day to create my own label for young or petite people. In 1989 at the age of 14, one of my teachers suggested to my Mum and Dad that they went to visit a school called Valance in Westerham, Kent. This was a school that catered for physically disabled children, somewhere that I could try and aim to do GCSEs by the age of 18. In this school, there were different teachers for each subject. One of my first classes was a design lesson, where we had to draw a pencil and then design a personal logo using a technical drawing board. I loved this, it was easy and it felt like such a professional thing to do. I understood immediately about plans and elevations and reading architectural drawings. I could just do it. At 15, things were really starting to happen for me; I ran a 10km cross-country race, I got my first Saturday job in a local food store and I learnt how to ski on a school trip to France. I decided to set myself a goal to achieve at least one thing every year from now on. At 16, I started doing Karate, this was an activity that my brother didn’t do. He was now taking part in pentathlons, these were not for me. I would not be good at high jump! I know my limits! Karate is something that promotes everything that I had started to stand for. ‘You get out what you put in’. At this point, I was asked by my paediatrician if I wanted to try GH treatment so I would reach 5′ 3”, I remember he suggested that if I didn’t reach this magical height then I might always be working in a supermarket type job and it would be difficult to get a girlfriend. I tried GH for one year and there was no significant impact from the treatment, I am now 4’10”. Although it probably did help my karate and gym training. Those comments at age 15 have resonated with me ever since, I hope doctors have learnt to be more careful about how they word things. I was also asked if I wanted another operation on my palate, which after much consideration I refused. At 17, I learnt to drive and passed my test on the first attempt. I bought my first car from my Saturday and holiday earnings. At 18, I was made redundant from my Saturday job because the shop was going out of business, (it wasn’t my fault..! Honest…!) So I applied for a Saturday/holiday job at Tescos. Since I had not been given the opportunity to meet the LEA people when we moved to Kent, I relished the opportunity of interviews. I knew that I could win peoples affections and impress them within a half hour interview. I always felt that the less they initially expected when I entered the room the more they would be impressed when I left the room. Me: Pointing to my design projects I said. “Well I have good ideas and lateral thinking skills but because I have communication problems with my speech impediment, I need a medium to communicate my ideas, and I think art is the way”. At the end of this one year course, for my final project, I designed a new theoretical subterranean exhibition wing to the college and I got a Merit grade for the course. I then progressed onto a 2 year HND 3D design course at the same college. By the end of 1994 at age 20, without having failed any gradings and in the minimum time, I achieved my Black Belt in Karate. I was also going to the gym everyday in my lunch hour and in total doing about 15 to 20 hours a week of exercise. In 1996, I was coming to the end of my HND and needed to apply for a university course, one of my tutors said that because I was making a lot of models of my ideas, she thought that a model design course would be a good option. So I applied to go to the University of Hertfordshire. I gained an interview. Shortly after I left home, driving to my interview, I started to cry and had to pull over. I realised and already knew that I had made it, whatever happened from here on in I was going to be successful. I was given an unconditional offer at the interview, without waiting for my results from the HND, although, I did get a distinction for my HND course. Like many people going away to Uni, I found this very difficult at first and being away from home meant I really had to get out and socialise. Since leaving school, I still felt like I had missed the whole cultural trip through not having a mainstream education. Education is not just about academia (although my essays were not that brilliant either), I felt that I had missed educated social interaction and learning about educated humour. I soon made some good friends, studied hard, and worked hard (part-time at Asda) and partied harder for 3 years. In 1997, at the end of my first year, I got a paid work experience – prop making on the film set of ‘Saving Private Ryan’ for which I cancelled a lad’s holiday…! But I felt I could not miss the opportunity. In my 2nd year I did work experience at a visual effects company called Artem, making a model for an animation. In 1999, I graduated with a 2:1 BA (Hons) Degree and for one year I worked as a freelance architectural model maker. Bit Boring! In December 2000, I had an interview for a model making position in the miniatures department on a new film called ‘Harry Potter’. When I first walked into the workshop with the model unit supervisor, I noticed the first impression of the workshop manager. His face said, “What will this little guy be able to do in helping to build a 30 foot model?” and when I started to talk to him he panicked because he could not understand me, because of my speech impediment. Luckily, I knew some guys that I had worked with before from my work experience at Artem, and was put to work with them. I knew that with the initial low expectations of the workshop manager I was going to do well. At the end of the first day, he came up to me and said he was very impressed and had not expected me to do such a good job! At the work Christmas party it was suggested to me that because I was quite small, I might be able to fit inside the Hogwarts model and install the fibre optic lighting for all the flamboux and window interiors. So when we returned in the New Year I was given this job within a team of 5 other special effects technicians. In 2002, on the next Potter instalment, I was called back but there were just 2 of us installing the fibre optics. Now I wanted to start finding my way back to the design department, and get back to the drawing board. Also, miniature model making was a dying art and was starting to be taken over by the computer generated stuff. So I enrolled on a one month Art Direction course at Pinewood Studios, where I started to learn draughting for film set design. I impressed the founder and mentor of the course, and he let me spend time there practising my draughting between model making jobs. In 2003, on the third Harry Potter, it was just me installing the fibre optics, and at the same time I was doing the same thing on a model for Charlie and the Chocolate Factory. I had created a niche market from my size and personality. I have subsequently worked on all the Harry Potter movies, the Wizarding World at Universal Studios in the USA and other films like Stardust, Pirates of the Caribbean etc. I now work on the drawing board and computer, as a design draughtsman, drawing sets, props and vehicles. I had always been a very anxious person, but in 2010, I realised that my anxiety was out of hand. I was having panic attacks, worrying about my health and worrying about being single. I went to see my doctor to get help and she suggested some CBT (Cognitive Behaviour Therapy). With the therapist, I broke everything down. I learned that everything that I did was an attempt to prove to people that there was more to me than what I felt they saw on the outside. So although I had always felt I had a lot of self belief, I was continually trying to communicate this to everyone, in a perpetual interview. I had been putting loads of pressure on myself, with work, girls, friends and family. It wasn’t until March 2011 that this knowledge would filter through and I would understand and my most recent revelation and epiphany would dawn on me. In September 2010, I joined the TARSS Facebook group. I was reading all the posts by other members and realised how alike the experiences of other RSS people were to my own. On 23rd September I noticed another member from Ukraine who was into rock climbing, skiing and fashion design, whose life experiences seemed to be similar to my own and she had such a positive outlook. I knew that I had to meet this person, so sent a friend request. We got to know each other through FB. I suggested that we met up and go skiing, and she said OK. At this point I still had some fears, I was frightened of flying, didn’t like being on my own for long periods of time and I had a fear of injections (some vaccinations are recommended for Ukraine). I knew that I could use my CBT techniques to overcome these, so I enrolled on BA Flying with Confidence course, which worked and I was comfortable to fly alone. I then went to the doctors to have all the vaccinations recommended (some of which were in 2 stages), even though I felt they weren’t all necessary, I wanted to work through my phobias. The trip also required me to travel alone on an overnight train across Ukraine and the whole journey would take 24 hours. In January I did this, I was very, very nervous all the way there. I met up with her and we had a brilliant time. On my return I realised that I had achieved so much and that I had always been too pre-occupied with my worries and trying to show ability and value, that I had actually been devaluing who I am to myself. I am not the boy who the LEA would not allow into mainstream schooling or the person that was told what might happen if I didn’t have GH treatment and reach 5’3”. I have achieved so much because of my desire to aspire. Now I am just proud of whom I have become and hope that this inspires other RSS young people to assume high values, success and happiness. On 24th June 2012, I successfully completed the Henley-on-Thames Triathlon, in aid of the CGF. I would like to thank everyone who sponsored and supported me. Diagnosis: severe IUGR (intrauterine growth restriction) due to placental insufficiency (diagnosed during pregnancy); Russell Silver Syndrome 11p15 loss of methylation (diagnosed when Emma was 18 months); heart defect detected when Emma was in KCH Neonatal Unit, and referred to the cardiologists who identified ‘Cor Triatriatum’. Body asymmetry: yes – right side from shoulder to foot smaller than left side. Emma wears a raised shoe with 2 cm platform on right shoe. While in the Neonatal Unit, an ultrasound test revealed a problem with Emma’s heart, which at first doctors believed was a heart murmur that would heal itself in time. As a precautionary measure, they decided to refer Emma to the cardiologists at St. Thomas’ Hospital who examined her and concluded she had ‘Cor Triatriatum’. Emma was born with a very rare heart defect ‘Cor Triatriatum’ which means ‘heart of three atriums’. The left atrium of her heart was divided by a membrane, which was blocking her blood flow. There was a small hole in the membrane which allowed some blood to circulate but as Emma grew the hole remained the same size, causing increased pressure in her heart. She was seen every 6 – 8 weeks by the cardiologists at the Evelina Children’s hospital, St. Thomas’, when she had an ultrasound to assess the seriousness of her condition. The cardiologists wanted to allow her to grow as much as possible to maximise the success of the operation weighed against the amount of pressure they could permit Emma’s heart to sustain. It was a judgment call on the part of the consultants. Each time we had an appointment we didn’t know what the outcome would be – whether the operation would be scheduled for the next few weeks as a matter of urgency… or not. We felt happy when the operation was not required immediately as it gave Emma more time to gain weight and strength but at the same time we wanted Emma to be out of danger with the membrane removed. 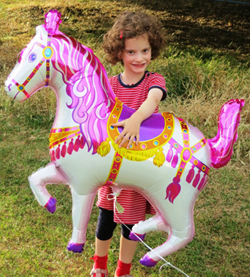 When the operation was finally scheduled we felt relieved but then Emma had a serious case of bronchiolitis… It was a very anxious time as she lost weight very rapidly and all the hard-won lbs she had acquired in the previous few months melted away. As well as dealing with the illness, there was the added pressure to try to ensure that Emma was 100% well in time for her operation. In the end, the op had to be deferred for a few weeks and I decided to take the added precaution of not having any contact with other children during this time. The day of the op was decided on and we had an opportunity to talk to all the professionals concerned – the consultant cardiologists, the cardiac outreach sisters and also the surgeon who would be operating on Emma. Questions we had were, for example, whether Emma would be able to fly in an aeroplane and whether she would be able to have children without impacting her heart. All the professionals were very supportive but meeting the surgeon was particularly reassuring as he emanated a calm competent manner. We had been told there was a 2% chance that Emma wouldn’t survive the operation, but that not performing the operation would result in Emma being on a life-long lung support machine. It was made clear to us that there was not really a choice. On the day of the operation, 13th November 2008, we arrived at 7.00am as requested, and Emma, 13 months, was oblivious to what lay ahead and played happily with the hospital toys. The anaesthetist came to bring a tiny theatre gown for Emma to change into and then led us to what seemed like a room full of people, all of them anaesthetists! 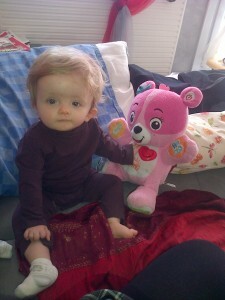 I sang ’The bear went over the mountain…’ to Emma (afterwards I thought, what a mountain she had to climb!) as the mask was placed over her nose and mouth…she was asleep within seconds and we were ushered away. The operation would take at least four hours so we decided to walk along the Thames towards Tate Modern to buy Emma some picture books. I felt surprisingly calm – perhaps due to my mind having replayed so often, in the weeks before, the worst case scenario of attending a funeral with a tiny white coffin…Inside Tate Modern, the sound of drumming rain was part of an art installation in the main foyer, a strangely comforting sound for me at that moment. Emma’s heart surgery was very successful and Emma recovered rapidly and in fact only stayed in intensive care for one day, after which she was transferred to the ward. She now has annual appointments with the cardiologists to monitor her heart, although they do not anticipate any further complications. Cor Triatriatum has not been linked to RSS as it is so rare, but a project in France is researching whether heart defects in general are more prevalent in RSS children. Emma’s geneticist asked us to participate in this project by providing Emma’s details and the paper is yet to be published. Emma is now 5 years old and is in Reception at primary school. She is now on target in terms of height for her age (between the 9th and 25th centile) and on the lowest centile for weight. She is full of energy and enjoying school. She has overnight feeds of Fortini via gastrostomy and daily injections of growth hormone. All the medical cares take place at home. After Emma’s heart surgery, doctors advised that she should have a naso-gastric tube again (she had one as a newborn in the KCH Neonatal Unit but was discharged without it) to try and boost her weight. The following seven months with the naso-gastric tube were particularly stressful as the tube would come out and have to be re-inserted on average every four to five days. Emma developed a fear of the community nurses who came to the house and this fear even extended to all unknown women. When the community nurses were not available (they were often overstretched with patient requests), I took Emma to the local A & E hospital to have the NG tube replaced – always quite an expedition and invariably a long wait as re-inserting an NG tube is not considered a priority in A & E. I also had to be particularly vigilant during the overnight feeds as the tube would on occasion wrap itself dangerously around Emma’s neck. On other occasions, the tube would suddenly come out during her overnight feed and the Fortini would continue to be pumped out and soak her cot with milk. For all feeds, the daytime Bolus feeds as well as the night feeds, the NG tube had to be tested for the correct pH level to check that it hadn’t moved to the lungs, which can be potentially life- threatening. For all these reasons I was very keen for Emma to have a gastrostomy, which at the time I considered the perfect solution after doctors said she would require long-term supplementary feeding. Emma was tested for reflux with the 24 hour pH study and was found to have moderate, mostly ‘silent’ reflux which would not be a barrier to having the operation. However, initially the gastrostomy created problems (this is due to the stomach being pulled to the surface of the skin and so closer to the oesophagus) in that it resulted in Emma having severe reflux to the point that I started to question whether we should have gone ahead with the operation at all. This lasted three months after which Emma was seen by the gastro-enterologist who prescribed Omeprazole and, eventually, the reflux was reduced. When Emma started nursery at age 20 months, she still had her NG tube until her gastrostomy operation two months later. Staff at the nursery were trained by the community nurses to give Emma Bolus feeds including checking pH levels by aspirating a tiny sample of her stomach contents through a syringe. On a few occasions, the NG tube came out while Emma was at nursery and the community nurses strongly advised that it should be re-inserted as soon as possible, in the nursery if necessary, something I had hoped to avoid as I wanted to comfort Emma at home as she was always so distressed each time it was re-placed. Fortunately Emma’s keyworker was very kind and affectionate and gave her plenty of cuddles and thankfully only had to deal with the NG tube for 2 months. 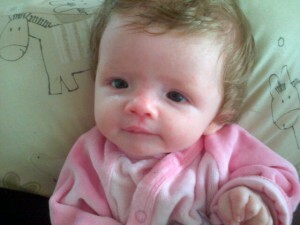 Emma had her gastrostomy tube operation in August 2009 and didn’t attend nursery for 2 weeks to fully recover. When Emma came back, the community nurses provided addtional training to the nursery staff and returned each time Emma was moved to a new room within the nursery. Emma was at nursery for three years, 3 days a week. In August 2012, Emma had another operation to have her gastrostomy tube or PEG replaced with a ‘mickey button’. 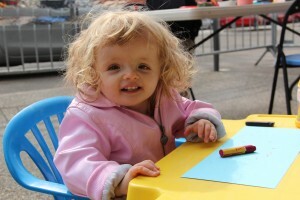 As a baby, Emma reached all her physical developmental milestones very late (she also had hypotonia – weak muscle tone). She could sit up independently only at 12 months and learned to walk the day before her birthday age 2. She had very low energy levels and feeding from the bottle was exhausting for her. She stayed in KCH Neonatal Unit for 11 weeks. After reaching the hospital target weight of 4lbs at two months, she had to stay longer in order to learn to bottle feed without dependency on the naso-gastric tube – this she achieved after another four weeks when she was allowed to go home! Only two nurses succeeded in bottle-feeding Emma and they both took great pride in having that particular gift (I certainly couldn’t match them except towards the end of her stay!) While at the Neonatal Unit, Emma was fed with 80% expressed milk and 20% Nutri-Prem 1 and later Nutri-Prem 2, as doctors felt she needed the benefits of a formula tailored to premmies. unhappy about the situation, and suddenly, after two weeks of witnessing Emma’s desperate crying, they acknowledged their mistake and reverted to three-hourly feeds. After five years, this incident still upsets me. Of course, at the time, Emma hadn’t been diagnosed with RSS with its risk of hypoglycaemia…Emma could potentially have been in danger by this hospital routine. It seems to me, as a basic principle, that any baby crying for food should have their needs met. Towards the end of Emma’s stay at the Neonatal Unit, the main objective was for Emma to learn to bottle feed and as the more regimented approach didn’t really suit her, they decided to do demand feeding – when Emma showed any sign of being hungry, we had to seize that opportunity to feed her! When she was discharged from KCH, she was prescribed with Infatrini, a high calorie milk for babies under 12 months who are classified as ‘failure to thrive’ (a term I dislike!) and is used as a food substitute for older babies who have problems consuming solid food. Because it is so densely packed with calories, more vulnerable babies struggling to drink can have a small amount, the equivalent of a much bigger volume of ordinary formula (or breast milk), and so conserve more energy to grow. Emma continued with Infatrini until 12 months and was weaned at 6 months (4 months corrected age) and even though she was only 8 lbs at the time and couldn’t yet sit up, the dietician said her stomach was ready for solid food, at least only purees. The baby-led weaning theory would have been completely inappropriate for Emma and probably most RSS babies! She grew quite well until she was 8 months and then her growth rate faltered and slowed considerably so that at 13 months she was still only 12 lbs. After 12 months, Emma was prescribed with Fortini, a food substitute like Infatrini but for toddlers and older children. Emma still has overnight feeds of 300mls of Fortini via gastrostomy. Emma’s RSS 11p15 diagnosis was made when she was 18 months, but she was tested for RSS mupd7 and also given an MRI brain scan at 2 months while at the Neonatal Unit due to her leg length discrepancy which a doctor linked to RSS. Both MRI scan and genetic test for mupd7 results came back normal. Testing for RSS 11p15 was not yet readily availble in 2007 as it had only been recently discovered around this time. The doctor who suspected RSS had told us what he believed (in a quite blunt and insensitive way, I have to say), but it was clear to us that the senior doctor considered conjecturing about syndromes to parents not appropriate as, when I tried to find out more about RSS, she kindly but very confidently asserted Emma’s leg length discrepancy and body asymmetry was ‘just one of those things’ and said that Emma was ‘a lovely little girl’ by way of reassurance. The counselling sessions and other professionals poised to get involved if Emma had tested positive for RSS at that stage were dropped and Emma was discharged as a particularly hard-to-feed IUGR premmie. ‘she’ll grow out of …’ but there was also a sense of relief that Emma’s problems had a label that professionals would respect and adhere to and I also felt pleased that I’d had an active part in finally obtaining Emma’s diagnosis. Emma’s endocrinologist is a key person in Emma’s care. He has been prescribing growth hormone treatment for Emma starting in May 2010. She has now had daily injections of growth hormone for over two and a half years and is currently, since November 2012, on 1 mg per day.The injections don’t cause her too much upset – she sometimes cries a little but usually just in anticipation rather than during or after the injection. In the first year of the treatment, she had two insulin tests, 6 months apart, which involved putting in a canula to test, at regular intervals, her blood sugars over four hours after putting 70 mls of Lucozade through her tube (she refused to drink it!). She has really benefitted from the treatment – I would describe it as an all round ‘tonic’. Not only does it help children grow in height , but it strengthens their muscles, improves stamina and increases energy levels. Emma is now on target for height, though she is more petite than her peers. She is full of life and I’m usually struggling to keep up with her when she shoots ahead on her micro scooter! Other professionals are her paediatrician who has known Emma since she was a baby and provides ‘holistic’ care – asking about all aspects of Emma’s development and occasionally giving a different viewpoint from other professionals which adds perspective to any choices we need to make as well as making things potentially more confusing! As a baby Emma had a dietician and a speech and language therapist (involved in a feeding programme) and Emma’s dietician continues to be involved in Emma’s care as she visited Emma’s primary school recently; the community nurses who we saw so much in the past still see Emma to assess her tube every three months; there is also a nurse who we can contact if we have a problem with the Easipod (the growth hormone injection device); Emma saw the gastroenterologist on a temporary basis when she had reflux problems after her gastrostomy operation; we see Emma’s geneticist occasionally as she is interested to see how Emma is developing and tells us about genetic research in RSS; and Emma’s GPs are always very attentive in dealing with Emma’s various health issues. We also have 6 monthly appointments with the Orthotics Department who measure Emma’s legs and feet so that the shoes I buy for her can be sent off to have a platform added on her right shoe. Sometimes people ask me if her smaller leg will ‘catch up’ and even doctors, incredibly, have sometimes thought that growth hormone will enable her right leg to catch up with her left. The growth hormone just gives her whole body an overall ‘boost’ and her leg length discrepancy is unchanged. When at Orthotics, we see Emma’s physiotherapist who checks her spine, as children with body asymmetry can develop curvature of the spine, but she has always commented that Emma’s spine is ‘nice and straight’. Perhaps this is partly due to the fact that, from the moment Emma started walking, she has always had a platform on her right shoe. We are grateful to all the professionals involved in Emma’s care. EMMA was born on the 13th of november 2012, 2 weeks early than scheduled. I had to undergo a C section as that young lady was stuck the wrong way around in my belly. Straight after birth she was taken by the doctors, I can still hear my husband saying “ omg her hand and feet are so tiny”. 2hours later I was about to meet my child for the first time when the not so clever nurse looked at me and said “sorry Madame, your child is a midget and she is taken care of by the doctors. The first night was full of tears and questions, Emma didn’t ask for any food and once again the not so clever nurse had a go at me saying I was a terrible mum, not feeding my child as I was supposed to do. I remain in hospital for 7 days, emma was unable to eat more than 20mml every 6hours. Our paediatrician sent us to the main hospital in Lyon in order to see a geneticist. At first sight she couldn’t see anything wrong with Emma except for a small size but she straight away excluded dwarfism due to her bones structures. We spent the next 3 month going back and forth to the hospital till the day we ended up in the gastroenterology service. We were supposed to stay there for 3 days…it lasted a month. The geneticist came back and this time she diagnosed straight away the SRS, as emma couldn’t eat, her body was asymmetric and she had a major gastric reflux. It was really hard for us to agree on a feeding tube for our daughter as like every parent we always think “it’s going to be ok”. From the moment they inserted the feeding tube on her noose she started putting on weight and that was a major relief for all of us. That time period from February till July was long and complicated as none of us had any medical references and feeding your child this way is just abnormal. In July she had a Gtube inserted in her stomach and also an operation to stop the food going up and down. In emma’ side we could see all the benefits of the gtube, in our side I started a major depression has it was all too much for me to cope with. We removed the G tube two years later. However my husband and the AFFIF association were here for me to help on a daily basis. Emma’father and I had an everyday fight for her to try normal food. I’ve been trying to feed her with any kind of food she would like. She is now nearly 4 years old and eats absolutely everything. Those past 3 years we spent more time at the hospital than at home. We meet Pr Netchine in Paris at the early stage and despite the fact that emma is not a proper RSS ( none of the numerous test came back positives such as biopsy, blood test MRI) but she definitely has RSS. Emma was sweating a lot and Pr Netchine suggested she might have sleep apnea….and she had a lot of it… She now has a machine at home at night. It helps her breathing properly but not only. She is not tired non-stop anymore, good bye black bags under her eyes and she is now sleeping 12 hours straight without moving a finger. In our medical marathon we had the chance to find a whole lot of doctor nurses ready to help and really child focused. Emma had to be follow in physiotherapy for 2 years as she was unable to sit or keep her head straight for a really long period of time. She is also follow by a psycho-motor therapist and and a speech therapist (we gave up on speech therapist as she now talks non-stop from 7AM till 9pm). I could go on and on about our medical fight however I believe there is more to say here about the child and his/her parents. When you get told your child is will or won’t be like the other child, your world is falling into pieces. However what we noticed through the years is that our emma didn’t see the difference between herself and other child and did we at the end. They need to live a life as normal as possible and once mum and dad are able to understand and fell that way…the child is going up the hill straight away. I will still remember the day my brain just stopped working and I was crying and screaming for help from both my husband and child. I couldn’t stand being my child nurse and spending my day at the hospital. That day my husband told me to go to bed and “don’t come back until you are feeling better). Well you know what Emma started to talk fluently a week later and became a nice young lady,. At the end of the day life is hard as you have to fight twice, you are sick of people telling you “ho my child is so sick I can’t cope with it…well mate he is sick for about 3 days and it will stop in 3 days max…) but you know what your child will end up having a normal life, with a smaller size than the other but no matter how he will be alive anyway. We started growth hormones beginning of 2016 and we can see so much difference , not only size wise but her muscle are getting stronger, she can run (kind of), goes up and down the stairs and well have a normal life. She is also running horses once a week. She is going to kindergarten 4 days a week at the moment and she will start school in September. That treatment is compelling as we have to do an injection every day at the same time, but at the end of the day it’s so worth it that it makes us forget all the inconvenient. Frankie is our 3rd boy, his siblings William and Patrick were full term and perfectly healthy babies but whilst pregnant I always felt that Frankie was a small baby. Our Obstetrician was closely monitoring pregnancy-growth and we were all set for a planned C section in January 2010 but the obstetrician advised that we may be having a 2009 baby if the baby still remained small. Other than the baby size, the pregnancy was straightforward enough however at 34 weeks my waters just broke. In hospital I was given steroid injections to help the baby’s lungs develop and 4 days later Frankie was delivered by C Section weighing just 3lbs and 6oz. Frankie was transferred to the Special Care Unit and did not need any ventilation, small but perfectly formed. He was NG tube fed breast milk for 4 weeks in Special Care and then tube/breast fed for 2 weeks before being discharged home. Once home Frankie continued to be breast fed but would need to be woken through the night to be fed, vomited frequently and very rarely cried. The vomiting worsened and we were advised to discontinue breast feeding and to try a variety of formulae feeds, none of which seemed to stop the vomiting. From 4 months to 12 months Frankie was in a cycle of feeding every 3 hours, vomiting the whole feed up and then keeping a second feed down. At 8 months he had a NG tube fitted as he was failing to thrive and this helped feeding but the vomiting continued. At 12 months Frankie was admitted to hospital with a nasty gastro bug and was very unwell, we were transferred to Dublin’s children’s hospital and during the week stay Frankie was reviewed by the Genetics Team. We returned home for Christmas but in January we returned back to Dublin to have an Oesophagoduodenoscopy to try and discover the reason for the vomiting, the examination revealed all was normal. 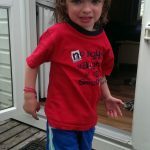 We, as parents, pushed for a PEG tube to be fitted having seen how much better Frankie was with the NG tube but not wanting to have that as a long term solution (it was intended for 2 months only). In April 2011 at 16 months Frankie had the PEG Tube fitted and whilst we were in Dublin, having this procedure done, we met with the Genetics Team who advised that Frankie has Russel Silver Syndrome which explained the prematurity, low birth weight and severe reflux. Frankie’s version of Russell Silver is thankfully uniparental (mother only) which for him means that he a milder version of the condition resulting in short stature, developmental delay and severe reflux. During all this time we were supported by the Early Intervention Team which is a multi-disciplinary team comprising Occupational Therapy, Physiotherapy, Speech and Language and a Dietician headed by a dedicated Paediatric Consultant. Frankie had had support from all these specialists at varying times and continues to see the community dietician and Paediatrician as required. Frankie started mainstream school at almost 5 years old and started in a specialised speech and language school, but after 1 year moved to mainstream school joining Senior Infants and he has transitioned very well. He currently is in 2nd year and is holding his own. At school he seems very content and copes with the academic work with support from school’s SNA resource, on a needs basis. He has a heightened sensory system which can affect his concentration span, exacerbated by his subsistence diet (he can tire easily) and he has time out sessions in school as required. Frankie’s needs have evolved over time and have been managed very well to date, however increasingly it has become apparent that unsurprisingly he has a heightened sensory system and can become very anxious at times. Loud noises (school tanoy) and stormy weather really worry him. Whilst he is the happiest child and never seems to complain (kids with high intervention often don’t and probably should) he can be over emotional at times. When anxious or excited, Frankie will flap his arms around and bounce for about a minute or grind his teeth. At home we have a secret friend whom he talks to occasionally. We are awaiting a review by an educational phycologist as there is an increasing suspicion that Frankie may have high functioning Asperger’s or similar. Again his needs have evolved and whilst many of his physical issues have been overcome new issues have arisen and in turn become predominant.